For over four decades both homeowners and those in the commercial industry have been able to benefit from ECHO’s professional and commercial-grade outdoor power equipment. The majority of such products are also made in the United States, reaffirming its place in the market as a quality brand Americans just love to use. ECHO is now well-known as a worldwide leader in developing and manufacturing hand-held power tools of varying models, and boasts over 540,000 square feet of manufacturing, warehouse and office space. It’s a loved and trusted brand that does all it can to cater to the ‘DIY’ needs of average Americans, as well as those industry professionals. ECHO is the largest subsidiary of the Yamabiko Corporation of Japan, and prides itself on being an innovator, not an imitator. This has enabled it to create technologically advanced chainsaws, well ahead of its time and ahead of its competition. This includes their 2-stroke engine with Pro-Fire® ignition system, vibration reduction technology, professional-grade components and grouped controls. Ahead of the game and leading the pack, all ECHO chainsaws are products of many hours of engineering and innovation for the benefit of consumers. Not only do their chainsaws consist of new forms of technology, but they are also priced well in the market, not above it. It makes fast, effective cuts. It lets out very little smoke. It’s affordable even if it’s not the cheapest. It is very easy to maintain compared with other brands. It’s in the mid range for price, there are cheaper saws on the market. It uses up a lot of chain lube. 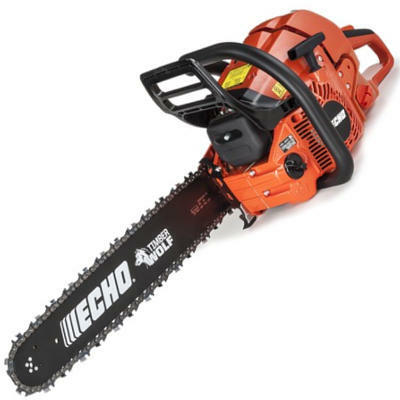 ECHO CS-310 14 inch chainsaw. Dimensions: 39.5 x 11.5 x 12.2 inches. QIs the bar made by Oregon? AYes. It’s an Oregon 14″ 91VG / 91P 52. QWhat fluids do you use with this chainsaw? AGasoline and 2-cycle oil. The ratio is 50:1 gas. QWhere is this chainsaw made? AIt is made in the United States from imported parts. QIs it a top handle saw? For the homeowner who requires a near-pro saw, the ECHO CS-310 is top of the class. It’s sturdy, reliable, starts almost on the first pull, and is easy to maintain. Its 14 inch bar and chain cut through wood with ease, and it’s lightweight to reduce user fatigue. It’s mid-range in price, but it offers true bang for your buck in terms of reliability and job efficiency. Check out what other people who purchased this product think about it. Read ECHO CS-310 gas chainsaw reviews. It has a reduced-effort starting system to make it easier to start from cold. It cuts up to 32 inch diameter logs. Accessing the chain tensioner is easy compared to other models. It has an automatic oiler for user convenience. Replacement parts are very affordable. Some of the parts look cheap. Dimensions: 12.25 x 11.5 x 39.5 inches. QCan a 20 inch bar and chain be put on this 16 inch saw? QWho is this saw marketed for? ACommercial users, but it can be used for home use. QWhat bar oil should I use with it? AECHO Bar and Chain Oil. QCan I buy cases for this chainsaw? AYes. ECHO sell hard and soft chainsaw cases. Designed for the commercial market, this gas powered chainsaw is in a league of its own when it comes to user convenience and reliability. It’s a tough, reliable saw which can cut through 32 inch diameter logs, and it boasts easy-start and easy-maintenance systems to take the hard work out of using a saw. It’s also lightweight in comparison to the amount of power it has, which is great for reducing user fatigue. Overall, this saw is top rated on the market and it’s easy to see why. Check out what other people who purchased this product think about it. 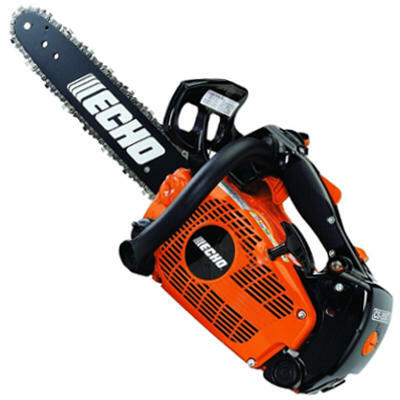 Read ECHO CS-352 gas chainsaw reviews. It has a 40.2 cc professional-grade, 2-stroke engine for optimum power. It starts easy with the i-30™ starting system. It comes with engine oil when most don’t. Users can experience the chain coming loose easily. Dimensions: 12 x 11 x 32 inches. QDoes it come with engine oil? QHow do you tighten the chain? ASlightly loosen the two nuts and turn the silver screw. QWhat is the easy-start feature? AIt allows you to operate the machine, when kept well maintained, within approximately 1-3 pull starts. With its genuine ECHO parts and professional grade engine, the gas powered ECHO CS-400 is a mighty, grunty commercial-grade chainsaw that easily keeps up with other competing chainsaws on the market. Its 18 inch bar and chain ensures the winter wood pile will be kept well stocked, whilst the i-30™ starting system reduces the time it takes to get the machine going. Overall, it’s a chainsaw with great performance, very little maintenance, and a lot of power. Check out what other people who purchased this product think about it. Read ECHO CS-400 gas chainsaw reviews. It has a powerful 59.8cc 2-stroke engine. It has a decompression valve to make it easier to start. It cuts through trunks easily. The chain adjuster doesn’t have enough travel on a worn chain. QWould it run with an 18 inch bar and chain? AYes, if the bolt pattern, oil hole and shape work with the ECHO CS-590 saw. QWhat size chain does it run? QDoes it have a primer bulb? ANo, but it has compression relief which does the same thing – make it easier to start. QWhat mixing ratio do you use? The ECHO CS-590 is a saw that is able to easily and efficiently cut through a variety of different woods and trees. Aimed at the professionals, its grunty 20 inch bar and chain take all the hard work out of getting the job done. The initial purchase of the saw, chain and bar is affordable, and so are all the replacement parts and accessories further down the line. It starts with ease, and it’s a top rated chainsaw with many great reviews on Amazon and to put those looking to purchase it at ease. Check out what other people who purchased this product think about it. 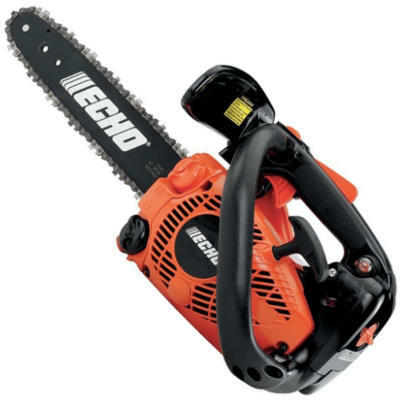 Read ECHO CS-590 Timber Wolf gas chainsaw reviews. Its air filter is easy to access as well as being heavy duty. It has a reduced effort starter. It has a clutch driven oiler. It has a powerful 50.2 cc engine for job efficiency. Some parts may need adjusting before first use. It’s a heavy saw in comparison to other brands with similar specs with chain on. QWhich bars can be used with this saw? QDoes it have a top handle? AYes, a composite top handle. QWhat is its fuel capacity? QWhat is its oil capacity? 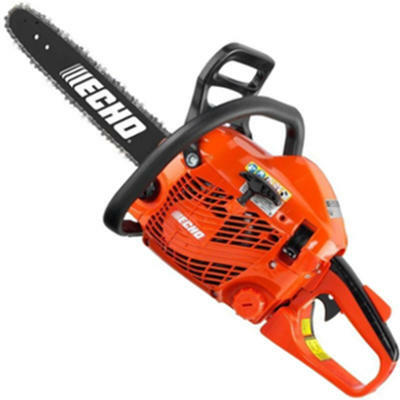 You would be hard pressed to find a gas powered chainsaw with the same specs which runs as good as the ECHO CS-490. It is lightweight, cuts fast and effectively, is built to last and starts easy whether it’s hot or cold. It’s also very easy to use with simple maintenance methods that people of varying expertise can understand. Overall, the ECHO CS-490 is an excellent example of a good, commercial grade saw that’s cost-effective, easy on gas and simple to use. Check out what other people who purchased this product think about it. 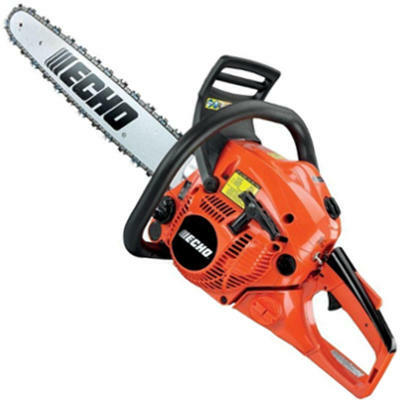 Read ECHO CS-490 gas chainsaw reviews. It’s a good chainsaw for cutting smaller branches. It has an inertia chain brake for additional safety. It doesn’t handle heavy duty cutting well. It’s cutting capabilities are limited. Dimensions: 8.98 x 8.27 x 10.12 inches. Weight: 6.6 pounds dry weight. QWhat is the oil and gas ratio? QCan you put a larger chain on it? AUp to 14 inches maximum, otherwise it will be underpowered. QIs it a top handle chainsaw? QWhat kind of oiling system does it have? The ECHO CS-271T is the perfect saw for the homeowner looking to undertake maintenance in their backyards. What it lacks in chain and bar length it makes up for in power for those basic pruning and trimming jobs. The powerful engine gives grunt when you need it, whilst the inertia chain brake is a great safety feature. It’s also very lightweight and starts with ease. What more could you want in a chainsaw? The cost in comparison to the features makes for exceptional value and a top rated chainsaw. Check out what other people who purchased this product think about it. Read ECHO CS-271T gas chainsaw reviews. It has a commercial grade 36.8cc engine. It has a comfortable top handle which is contoured for easy use. It has an automatic, adjustable clutch-driven oiler for user convenience. It needs refuelled with petrol often. It’s more of an arborist’s saw because of its top handle. Dimensions: 11.30 x 9.61 x 8.66. Weight: Dry weight is 8 pounds. QWho is the saw marketed towards? QWhat is the fuel capacity? QWhat is the oil capacity? QWhat is the handle made out of? In comparison to the price, what you get is a whole lot of power, and not a lot of trouble! The ECHO CS 355T is the epitome of what a professional saw should be, and many users of it swear by it. From its lightweight frame which allows it to be used both in the air and on the ground, to its powerful motor that sees you cutting through trees with ease; it’s a great machine. Overall, it’s competitive in the marketplace and is for sale at a reasonable price. Check out what other people who purchased this product think about it. Read ECHO CS-355T gas chainsaw reviews. It has replaceable bumper spikes to make cutting easier. It’s flexible in its chain length and can use 20, 24 and 27 inch bar lengths. It has a very grunty 66.8cc engine. It has an inertia chain brake for safety. It uses up a lot of petrol. 24 inch bar and chain. Dimensions: 17.1 x 9.3 x 11.9 inches. QWho is the saw targeted to? QWhat is the saw chain pitch? QWhat is the guide bar gauge? QWhat bars can be used with this saw? A20, 24 and 27 inches. The CS 680 is ECHO’s most popular felling saw out of all its models. It’s fast, reliable, offers unrivalled hardiness and has flexibility for each and every job it undertakes. Whether you’re felling the fruit tree in your backyard or a forest block, you are sure to be pleased with the power and stability that’s on offer with the CS 680. 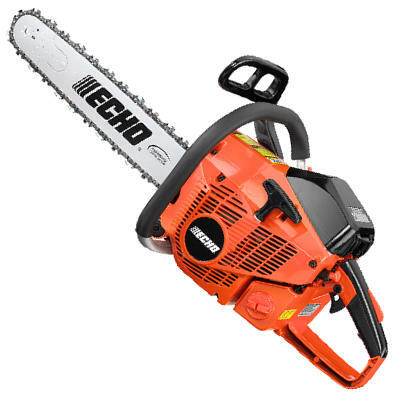 Overall, this would have to be one of the best ECHO chainsaws for the money. Check out what other people who purchased this product think about it. Read ECHO CS-680 gas chainsaw reviews. It has onboard tool storage for repairs and maintenance away from home. Unless you buy a second battery, you can’t take it too far from a power source for long periods of time. The chain design is poor. 4 amp hour lithium-ion battery. Power Source: 4 amp hour lithium-ion battery. QHow long does it take for the battery to recharge? QDoes it have a power cord? ANo. It runs on battery. When you’re looking for a saw that offers optimum power without all the mess and fuss of fuel and oil, then the CCS battery chainsaw from ECHO is for you. The battery life is incredible, and yet from empty it only takes 30 minutes to charge. With one charge you can expect up to 112 cuts. The engine runs smooth, the cuts are accurate and the automatic oiler takes all the fuss out of remembering to oil it yourself. There are so many rave reviews about this product and it’s clear to see why. It’s in a league of its own. Check out what other people who purchased this product think about it. 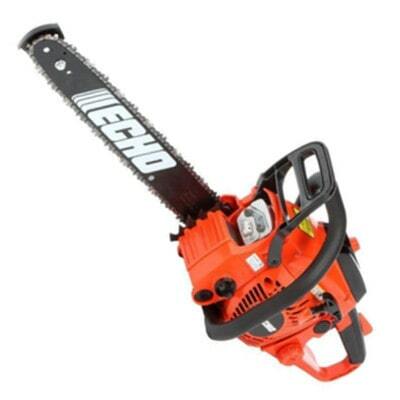 Read ECHO CCS-58V4AH cordless electric chainsaw reviews. Parts are widely available for it. It does not start well. It’s not well put together. Dimensions: 15.5 x 9.6 x 10.9 inches. QWhat is the fuel and oil mix? A1:2 mix of oil and fuel. Reviews in this buying guide and online for the ECHO CS 370 have been extremely mixed. If you’re looking for the best ECHO chainsaw for the money, one which is reliable right out of the box, this may not be the one for you. There seems to be some manufacturing issues with parts coming loose, and the overall starting mechanism has been poor. Some people find it a very reliable, easy-to-use saw, and for those who need it for around the home and are mechanically minded, it’s a good option. Check out what other people who purchased this product think about it. Read ECHO CS-370 gas chainsaw reviews. 20 inch camouflage chainsaw carry bag with compartments and a padded strap. 20 inch nylon carry bag with tool compartment and padded strap. Small chainsaw case for small to medium saws with an 18 inch bar. ToughChest chainsaw cases with slots for storing tools and room for up to either a 20 inch, 24 inch or 32 inch bar. All ECHO chainsaw cases are designed to protect the chainsaws both at home and out in the field. Many of them come with slots for tools, and room for carrying accessories as well. If you are looking specifically for ECHO case, check out this comprehensive guide about available ECHO chainsaw cases. However, if you’re looking for a case in general regardless of the brand, you would love to read this full buying guide on how to select the best chainsaw case for the money including reviews & comparison. ECHO cares about your safety out in the field. Not only does it make sure its chainsaw models feature top quality safety features to keep you as safe as possible, but it also produces safety clothing as well. ECHO chainsaw chaps are constructed of the highest quality materials for your peace of mind. They are premium professional and commercial grade leg chaps in an apron design, and come in a range of sizes. They also feature 12 layers of polyester with an expandable waist and large pocket. There’s also no concern about getting them dirty either as they are easily washed as well. If you are looking specifically for ECHO chaps, check out this comprehensive guide about available ECHO chainsaw chaps. However, if you’re looking for chaps in general regardless of the brand, you would love to read this full buying guide on how to select the best chainsaw chaps for the money including reviews & comparison. It can be a hard day out on the job when you’re dealing with harsh environments such as forests. While you’re protecting your saw with maintenance, you should be protecting your hands as well. ECHO offers premium chainsaw gloves in a range of sizes. These gloves have two layers of kevlar on the back to protect you from cuts, as well as foam pads on the palms to reduce vibration. To give you a firm grip on the chainsaw, the front of the gloves are made of goatskin leather, whilst the fingertips and knuckles have been reinforced and are sealed tightly closed with velcro. Everything has been thought of for the safety of your hands. If you are looking specifically for ECHO gloves, check out this comprehensive guide about available ECHO chainsaw gloves. However, if you’re looking for gloves in general regardless of the brand, you would love to read this full buying guide on how to select the best chainsaw gloves for the money including reviews & comparison. ECHO ensures it has the best chainsaws for the money, but it also ensures it gives you the best protection at reasonable prices too. Not only does it ensure its safety features are top notch, but it puts special emphasis on its helmet range as well. ECHO helmets have a mesh face visor and ear protection to see you through the job safely. They are also made of hard, protective materials to stop you from being injured by small falling pinecones or branches. ECHO helmets have a noise reduction rating of 22 decibels. If you are looking specifically for ECHO helmet, check out this comprehensive guide about available ECHO chainsaw helmets. However, if you’re looking for a helmet in general regardless of the brand, you would love to read this full buying guide on how to select the best chainsaw helmet for the money including reviews & comparison. If you are looking specifically for ECHO boots, check out this comprehensive guide about available ECHO chainsaw boots. However, if you’re looking for boots in general regardless of the brand, you would love to read this full buying guide on how to select the best chainsaw boots for the money including reviews & comparison. The key to a good working chainsaw is a sharp blade. Not only does it allow you to cut through wood like a knife through butter, but it also helps reduce kickback. ECHO sharpeners are affordable, can be purchased both online and in hardware stores, and come in a variety of sizes and boxes. You can either purchase them in packets of two, or boxes of 12. There are also plastic file handles available too, enabling you to get the chain sharpened safely and effectively. If you are looking specifically for ECHO sharpener, check out this comprehensive guide about available ECHO chainsaw sharpeners. However, if you’re looking for a sharpener in general regardless of the brand, you would love to read this full buying guide on how to select the best chainsaw sharpener for the money including reviews & comparison. Some chainsaw brands, manufacturers and models are hard to find replacement bars for. With ECHO, this is certainly not the case. Not only can you purchase quality bars in varying lengths depending on your particular model online, but you can buy them in dedicated hardware stores as well. They are good quality laminated bars at very affordable prices. Often replacement bars can be expensive when you’ve already outlayed a lot of money for the chainsaw itself. ECHO is dedicated to providing affordably priced bars for all of its makes and models. If you are looking specifically for ECHO bar, check out this comprehensive guide about available ECHO chainsaw bars. However, if you’re looking for a bar in general regardless of the brand, you would love to read this full buying guide on how to select the best chainsaw bar for the money including reviews & comparison. There are several affordable chains available from ECHO retailers and online. The chains are constructed using high quality materials, and you will never have any trouble finding one that is compatible for your ECHO chainsaw – regardless of the model. When it’s time to replace the chain on your ECHO chainsaw, ensure you replace it with an ECHO branded chain. This will ensure your chainsaw will run correctly with quality parts. If you are looking specifically for ECHO chain, check out this comprehensive guide about available ECHO chainsaw chains. However, if you’re looking for a chain in general regardless of the brand, you would love to read this full buying guide on how to select the best chainsaw chain for the money including reviews & comparison. Bar and chain oil, as well as fuels, lubes and oil can all be purchased for ECHO chainsaws. Each type of oil, fuel or lube comes in varying quantities to give you the best deal. This gives you the freedom to decide how much you will use in comparison to the price. It can often be more cost effective to buy more to get more bang for your buck. If you are looking specifically for ECHO oil, check out this comprehensive guide about available ECHO chainsaw oil. However, if you’re looking for an oil in general regardless of the brand, you would love to read this full buying guide on how to select the best chainsaw oil for the money including reviews & comparison. ECHO is the brand, however it is a subsidiary of the Yamabiko Corporation of Japan. 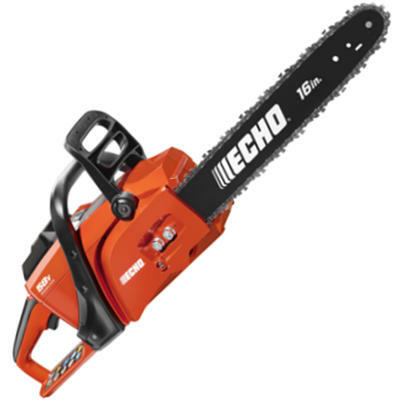 Where are ECHO chainsaws made? The majority of products made by ECHO are built in the United States. However, foreign and domestic parts are used. 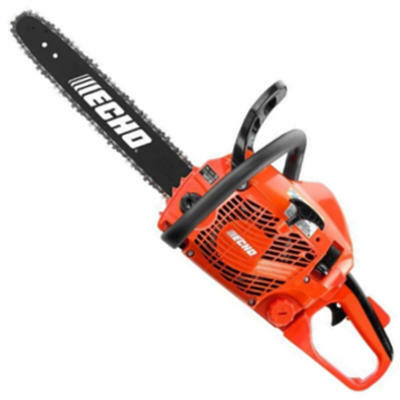 Where to buy ECHO chainsaws? There are 10 distributors selling to 6,600 dealers in North America. There are also 24 Latin American distributors. You can also purchase ECHO products from Home Depot stores not only in the US, but in Canada, Mexico and Puerto Rico as well. Echo products are also available online on websites such as Amazon where you are guaranteed a good deal.